Some of you have asked questions re- the project, so I thought I would answer for all to see. Susan asked : "What is an Aggy for those who are not knowledgeable about plants?" 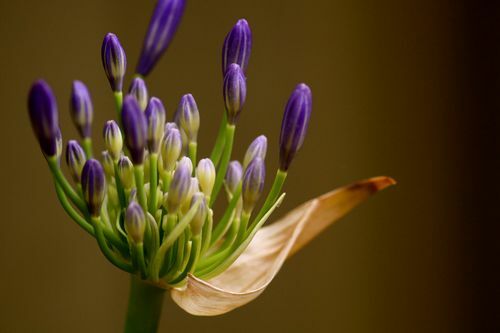 Agapanthus is commonly known as "Lily of the Nile", but it is not a lily and all of the species are native to South Africa from the cape to the Limpopo River. "It is fascinating to see how your pieces evolve. Are the fern leaves on top of the fern batik?" Yes, I put fusible web on the back of some of the fabric and chose an area where it would blend. I cut out individual leaves and laid then over the top of the existing fabric blending as well as I could and it softens the bottom of the picture. I do it quite often. Take this quilt of Tilly. 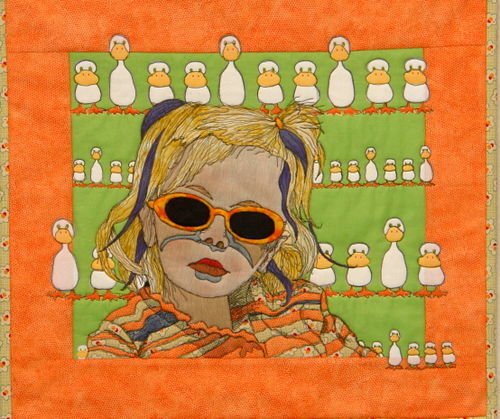 the little ducks coming out of the picture were appiqued on over the top of the existing fabric. The three ducks at the top, – I added heads, the one on the right hand side was appliqued over one that was cut off…the ones behind Tilly's shoulders I added one on either end and of course the little ones at the bottom of the picture… it makes it more dimensional. More interesting. "Pam, do you have a picture in your head of the finished piece when you start or does it evolve as you go? Sometimes I do, I compose pictures all the time in my head… I call them photos in my mind. But this one came from one of my photos that I manipulated in the computer. I did that when I was traveling, so I wasn't really sure how I was going to implement it. But to answer your question, I often know excactly what I'm going to do, color, design, fabric and for me it takes very little planning. It comes from my background as a Fashion Designer. I would see a fabric I like and picture the garment in my head. Sometimes. I never know how a project will come out and I audition quite a lot…. it just depends on the subject. Are you planning on using this as a class technique? Yes I will, I already have quite a few classes scheduled with thread painting techniques for this year, but I am always adding new things and in this one it will implimentthe texture in the background. I am finding your thinking processes fascinating as this piece evolves and it is something a student doesn't usually have access to as most teachers show a completed piece of work to a class. It is the thinking processes more so than the technique and product which enables a student to become independent of the teacher as it teaches them to learn for themselves. I love it. Thanks for sharing. Chris, you are correct. Of course I have students who want to do just what I do…. however, I strive to get them to think through the creative process. One way I do that is to give a presentation in every class. Students can see how the design evolved. Of course I share a lot on the blog and that helps when students come to class. I love the agapanthus. When I lived in southern California you saw them a lot. I especially love the blue ones. We can’t grow them here in St. Louis, at least not outdoors year ’round as it’s too cold. Merry Christmas, everyone! P.S. Baby is so sweet. Very good Christmas present, huh? Next PostMy blackberry is not working.